An easy way to spruce up your bathroom is to change the shower head. Installing a new shower head is a simple and relatively inexpensive do-it-yourself project. You can spend anywhere from $10 to $500 for a shower head. There's a model to fit every taste and budget. Shower head manufacturers include Kohler, Moen, Delta, Grohe and American Standard, among others. Most shower heads are mounted on the wall, but a few are attached to the ceiling. Before you buy a shower head, ensure that the water pressure is adequate for your purposes. For example, some consumers complain that certain rain shower heads produce a soft flow of water that isn't strong enough to rinse out shampoo. The first thing you should do is read the instructions that accompany your new shower head. Some shower heads need to be assembled, may contain a rubber washer or need to be attached to an extension arm. The following are simple steps to change a shower head that is mounted to a wall. Turn off the faucet. If you try to remove the existing showerhead with the faucets turned on, water will shoot everywhere. As long as your faucets are in the "off" position and they function, it's not necessary to turn off the water to the house. Unscrew the existing shower head. If the shower head hasn't been removed for decades, it could be corroded and you will need to use a wrench to get it off. Turn the neck of the shower head counter-clockwise to remove it. Be careful not to turn the pipe in the wall. 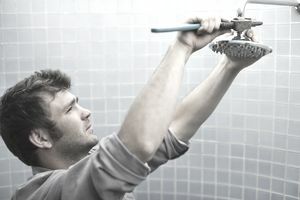 If necessary, turn the shower head by hand while holding the connecting pipe still with a wrench. Wrap the pipe with a soft cloth first to protect. Take care to protect the old shower head's finish by placing a soft cloth around the neck before applying pressure with the wrench. Even if you plan to throw away the old shower head, if the new shower head is broken in the package or the wrong type, you will need to put the old shower head back in place. Remove excess dirt. You may find gunk around the threaded pipe in the wall after removing the old shower head. Use a damp paper towel and wipe the threads clean. Dry the threads. Apply Teflon® tape. Examine the pipe threads and calculate how much tape you will need. You want to use enough tape to wrap around the threads, covering about half of the tape width as you wrap up the threads. Start at the base and moving clockwise, wrap around twice, then continue going around until you reach the end of the threads. TIP: Do not wrap counter-clockwise or the tape will unravel when you attach the new shower head. If you run short, remove the tape and start over with a longer piece. Run your thumbs over the tape to smooth it into the threads. The tape will seal the connection between your new shower head and the pipe in the wall and prevent leaks. Attach the new shower head. Read the product manufacturer's instructions. Your shower head may not require a wrench to securely fasten it to the pipe in the wall. Hand screw clockwise onto the taped threads. When it is secure, hand tighten a quarter turn. Do not over tighten. Turn on the faucet. Step out of the way, angle the shower head toward a wall away from you and turn on the cold and hot faucets. Check for leaks. If you spot a leak, the shower head is not tightened enough. Turn off the faucet, wrap the neck of the shower head in a soft cloth and tighten with a wrench a 1/4 turn. ​At the time of writing, Elizabeth Weintraub, CalBRE #00697006, is a Broker-Associated at Lyon Real Estate in Sacramento, California. What Is a Qualified Intermediary for a 1031? Defer Capital Gains With a 1031 Exchange? Real Estate Tips: What Are the Tax Benefits of 1031 Exchanges? Will a Room Addition Add Value to Your Home? What's the Deal with Get-Rich-Quick Real Estate Seminars?